Mix the 6 slices of dry rye bread in a blender then place the breadcrumbs in a soup plate. Break the egg into a soup plate, beat for a few seconds until smooth then add salt and pepper. Butterfly the chicken: slice the breast in half down the middle lengthwise, taking care not to cut all the way through to the other side. Insert two slices of Jambon cru du Valais IGP raw ham and one slice of Raclette du Valais AOP cheese. 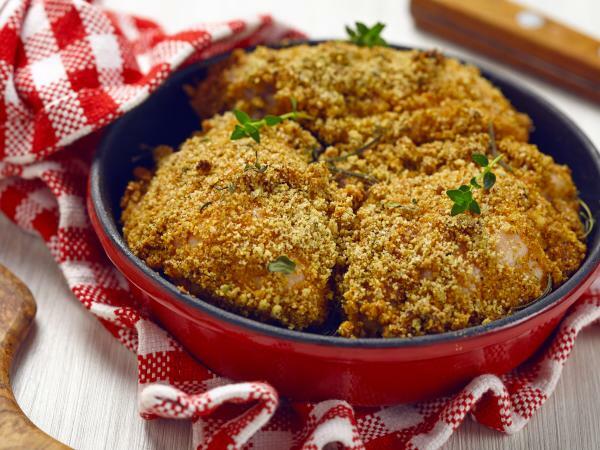 Dip each piece of chicken into the flour, then beaten egg, then breadcrumbs. Cook the chicken cutlets for a few minutes in a little butter. Pop them into the oven for a few more minutes to make sure they are cooked to perfection.